This morning before going to work I visited the neighboring woods, having taken it into mind that I would visit the sit spot I used during Kamana, but haven’t been to since last winter. Soon after breaking off the trail and climbing steeply uphill through the undergrowth toward the spot, I heard a bit of rustling of leaves and snapping of twigs. It surprised me, as I’d never seen another person near this spot – people rarely ever venture off the trails in this area at all. After stopping and listening for a short count, I continued on my way, thinking that I was probably making enough noise that the person would hear me, as I heard him, and thus wouldn’t surprise someone in awkward encounter. A few steps later, as I came above the rock overhang that my spot sits on, I was greeted by a deer munching on the leaves of a young sapling. This surprised me more than the human I expected. Though the forest is home to deer and cougar, they usually stay in the deeper woods, not as close to the main trails as we were here. I froze, partly out of surprise, and stood still, not staring at the deer, but keeping my peripheral vision trained on him. He looked in my direction, but continued munching and didn’t seem terribly concerned. I can’t imagine that he didn’t see or hear me, but the wind was favoring me by blowing downhill onto my face. Without my scent to alarm him, he must have decided that I was little more than an interesting stump. When he turned his back to me, I slowly dropped my pack and went prone, thinking it would be fun to see how close I could get. 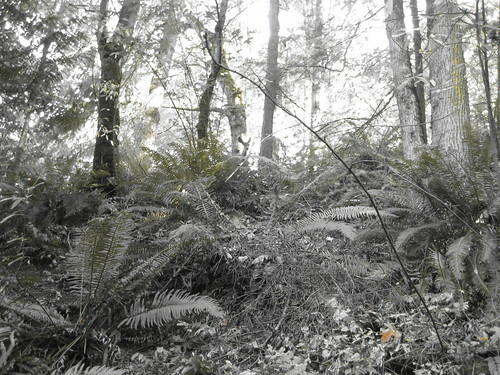 Like most pine forests of the Pacific Northwest, the area was dense with undergrowth such as ferns and Oregon Grape. It all provides for great cover when you’re hugging the floor, but makes moving quietly in it a challenge. I stalked the deer for 15 minutes, not getting much closer than I was when he first surprised me, but doing my best to maintain the distance as he moved. Within the first couple minutes he led me to 2 other deer slightly further up the hill which I had neglected to spot previously. Stalking humans is much easier! When compared with most people who tromp through the woods, I can walk with a measure of silence, but attempting to match pace with such an animal while not making noise gives one great respect for the deer’s ability. All the while I was crashing through the undergrowth, despite my best efforts at silence, while the deer would effortlessly bound ahead, snapping only the occasional twig. Eventually they ditched me, but making my way back down hill to where I dropped my pack, there were plenty of tracks in the soft ground to gaze at. Back on the trail, I encountered people dressed in their stylish reds, blues, and yellows, and was struck by how sad it was that they could never experience such an encounter while garbing themselves in such eye pollution. This post was published on 2008-09-23 . It was modified on 2012-09-15 . It was tagged with tracking, deer, bushcraft, stalking.